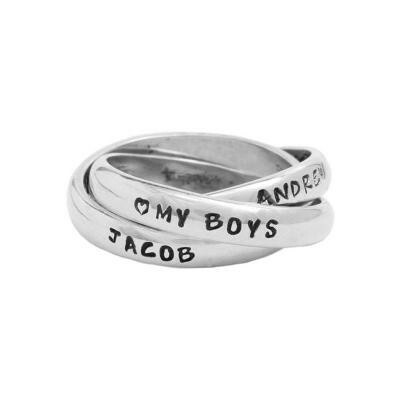 "Unique Grandmother's Name Rings for Two Children in silver, Triple"
The triple name ring is a unique grandmother's ring stamped with names. Be creative and put "my boys", "my girls", "family" or "love" on the third band. Ideas for stamping: put two names on two bands and then either leave the third blank (saving room for a later addition :) ) or put a special word on the third band. The triple name ring is a wonderful gift for the grandmother of two. If you like the look of the triple or know you will to have a third grandchild later - the triple name ring is a great option! For for a grandma of two kids put the names on two of the bands and "my boys","my angels" or "my girls" on the third band. Or you can just leave the third band blank - if you have a third grandchild, you can send it back to have the new name stamped at a later date for a small fee. I wear it constantly. Best gift I have ever done for myself!! Highly recommend this ring! !